Machine Learning is a popular buzzword these days. It’s no wonder, because it is easy to get excited about it – and for good reason. The simple truth is that it can create huge advantages and potentially divide businesses into A and B categories. For most companies, the discussion about Machine Learning should be much higher on the agenda, but they mostly have an empty chat about it using many big words and vague terms without taking action. The concept quickly sinks in importance next to all the other concepts and buzzwords of the day, like Big Data, Digital Transformation, VR and so on. Thus, the discussion about the importance of Machine Learning for business often does not take place and consequently, companies miss out on great opportunities to strengthen their businesses. Why the interest in machine learning now? Strengthen your business – that is exactly what Machine Learning can do. The opportunities and the need for Machine Learning have never been greater. The exponential increase in the amount of data collected is hindered by human constraints in terms of interpreting and acting on that data. In fact, according to some estimates, in the last year as much data was created as previously in the entire history of humankind. This also indicates a trend – and confirms that we must prepare ourselves to handle a rapidly increasing amount of data in the future. 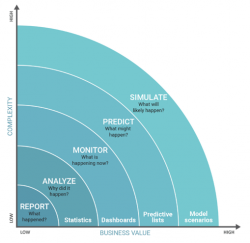 Are you really data driven? Most CMOs and marketing managers would just nod in agreement with that statement. Of course, they are facing a dramatic increase in the amount of data collected, which has made their jobs even more complex when it comes to making decisions. There has been a sharp increase in the number of data sources (for example from Facebook, Google, Twitter, web analytics, e-mail marketing programs, ERP systems and CRM systems) and all these sources should be considered for coherent decision-making. Who wouldn’t like to claim they are “making data-driven decisions”? Despite all best efforts, the good use of business data is limited compared to its real potential. We already gather so much data, that it often feels necessary to take a step back and rethink what the purpose of collecting all that data really is. Part of the answer to that lies in Machine Learning. As we can see from Google Trends, there has never been as much interest in Machine Learning as there is now. This is because Machine Learning offers a new paradigm for interpreting and acting on data for business. It is estimated that the active use of Machine Learning over a 1-3-year period can have a 30% to 50% positive impact on the bottom line for most companies. The truth is, it does not always have to be a comprehensive and complex project. On the contrary, good value from Machine Learning can be gained through many smaller projects across the organization and business operations. As an example, IIH Nordic significantly optimized the page load speed of a larger Danish company’s website – using only Machine Learning. To be more specific, we built a Machine Learning model to understand individual user’s intent on the website by using multiple data sources. 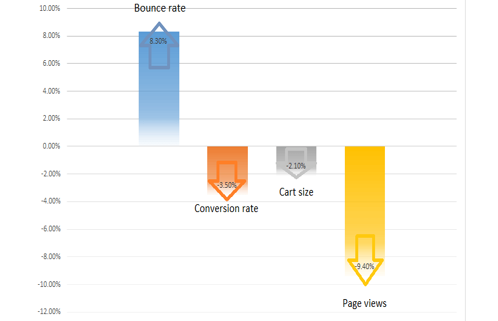 After deploying this model, we can predict what pages a user will likely visit next. The browser pre-loads the predicted web pages in the background so they are ready and can be delivered immediately when users click on the expected link. This technology improves user experience and increases load speed by 34%. In this case, the value is very easy to see as it relates to one of the most important parameters for digital communication – speed. Amazon was one of the first to conduct a comprehensive study on the relationship between speed and number of sales and their unambiguous conclusion was that there was a direct correlation between speed and sales. Given the pre-loading example, if a company spends more than 50 million DKK (around 6,7 million euros) per year on advertising, a 34% improvement in load speed would result in a bottom line improvement of about one million DKK. This demonstrates the potential and real value of Machine Learning. Are there other possibilities for Machine Learning in marketing? In practice, there are almost unlimited possibilities with Machine Learning. There are, however, two main requirements for success: data quantity and data quality. For instance, it is not only important to identify the most important touch points from TV, content, e-mail, search, website, etc., but it is also essential to have a common identification key across the different data sources. This makes it possible for Machine Learning systems to explore trends across sources and to identify connections within and across each of them. Can Machine Learning enhance e-commerce revenue? The impact of the above has resulted in savings of approximately 10% and an increased conversion rate of almost 20%. When do customers read your messages? Another relevant Machine Learning project can be to customize your e-mail communication, taking into consideration when recipients actually read your newsletters. When and how we read newsletters varies greatly from person to person. Some people open them on their mobiles, others still prefer to read them on desktop computers. Through Machine Learning, it is possible to process recipients’ preferences and behavioral data collected over time to automatically target them with your messages at the optimal day and time. What is the process of getting started with Machine Learning? Strategic knowledge as well as connected specialized knowledge in Machine Learning skills and strategy. Beyond managing the data, successful Machine Learning also requires a very high level of teamwork. In our experience, organisations should first focus on creating the 1.0 model, rather than building a huge setup. Think big, but start with a small step. We believe that Machine Learning will be the driving element of the fourth industrial revolution and hope that businesses recognizing its value will dedicate themselves more to it in the future. If you want to learn more about Machine Learning and its potential applications for your business, please contact us. Tryg’s Award Winning TMS Implementation Does Machine Learning make sense for your Business? Yes!